The Markoprint X1JET is a compact and powerful inkjet coding system that is available in field upgradable versions to suit the exact print need of the customer. The X1JET is designed for a wide range of coding applications for use in many industries. It is a fully capable coding system that can be employed to print complete track & trace information and codes. The X1Jet is so simple to use that it requires no training due to its 3-logic intuitive operation with LED status lights. The X1JET uses True Type fonts for printing and prints all conventional 1 and 2 dimension bar codes. The system is simply integrated into packaging systems and conveyors for printing from the side or top. 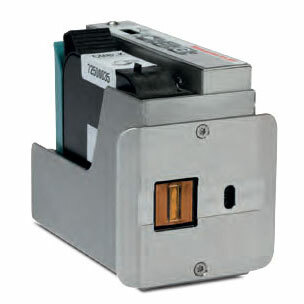 The unit is supplied with an already integrated photo sensor for print triggering. External print signaling is an option when beneficial. Rotary shaft encoders, flex mounting brackets for varying product size and shape, full Ethernet network control options including a smartphone app option are all available to suit the needs of your installation. A wide range of water and solvent based inks to work in virtually any application or with any material. Paper, cartons, coated surfaces, foils, plastics etc. are coded permanently, with excellent high resolution print clarity.